Recently I was reading palms on the sidewalk of lower State Street at Tuesday’s Santa Barbara Farmers Market. I had gone there to shop the week before and noticed an astrologer actively reading for clients. She graciously told me how to set up. I made time in my schedule and I did. There I sat with two folding beach chairs and my folding wooden sign, which reads, “Island Palms-Lecturas de Manos y Cartas”. That’s “readings of palms and cards” to the monolingual, or the uninitiated. A local artist had painted this masterpiece for me when I was working on Isla Mujeres in Mexico years earlier. Now tattered and repainted several times, the conversation-starter still does the trick, attracting business whenever it’s in use. Because the sign announcing my services is partially written in Spanish, in situations like this, so is half of my clientele. I had couples paying for five minutes at a rate of a dollar a minute – my announced fee. Typical scenario: the woman notices the sign and stops, shows it to her boyfriend, they talk, she sits down, and then she pays. I read in English. Then he sits down and she translates my less-than-fluent attempts at Spanish to him. Customer traffic was kind of slow, so I left a friend to guard the chairs and wandered off to do a reading in trade for a bottle of organic olive oil at a nearby stall. When I came back, a woman had been reading my scrapbook of columns. She jumped up, eager to see me. “Is this you, are you the palmist?” she asked. I nodded affirmation cautiously. She wanted me to read her palms and tell her everything that would happen from that day on. Her dog had just died. She didn’t even want to pay me a dollar. She moved on, swaggering in exasperation, as I made clear that my price was firm. Soon her place was taken by an amiable fellow who paid a dollar, sat down, and said, “Tell me about love.” I said for a dollar, I would tell him what leaped out at me as the most significant feature I could quickly see. Then someone interesting came along; one of the Santa Barbara homeless. He was a colorful character – you know the type. He was toothless, cheerful, and grinning from ear to ear, pushing a shopping cart that contained all of his possessions. He chatted a bit over the sign, sat down on the curb, handed me a buck, and held out his hand. Immediately I saw two formations that I had never seen before. The first were two prongs that were visible in his early life line. Starting from the beginning, midway between the setting of the thumb and the beginning of the pointer, two separate strands of the life line began and went their separate ways, plummeting toward the center of the palm for about an inch. Then they merged into one and continued on. This formation interested me because I have always argued against psychiatric diagnostic categories. They seem arbitrary and made up for the sole purpose of labeling people, ruining them for life in a society that expresses an aversion to differences. The same people who claim that these categories are useful in ranking some traits as superior to others – much like the Nazis did – often say that the homeless are mentally ill because they are mentally ill. Not because homelessness can drive people crazy. It’s that old nature versus nurture, genes versus environment debate. Which is causal? A nursing professor at a university in the Midwest – where I used to teach – received a grant so she could take college students to live on the streets of New York City. The bombardment of sensation – combined with powerlessness and a lack of boundaries – soon created, even among the so-called “normal,” a smattering of psychiatric symptoms. Her experiment was much like the famous study in which a researcher checks himself into a psych ward and ends up labeled crazy as a loon and is unable to check out. This belief that diagnostic categories, originally created by and for testing in the military, can be damaging when used amongst civilians for overall typing has been substantiated by most of what I have heard, read, and observed. For example, a doctoral student at Pacifica I worked with last quarter is dedicating her doctoral work to exposing how multiphasic personality tests are misused in legal custody battles. But right in front of me loomed the disturbing indication that this homeless man was split, or schizoid, very early on in his life. Only later were the separate parts of his personality merged into one – most likely in order to cope. His divergent early life line was evidence to me that the schizophrenia would have existed first, predating his current situation, and perhaps even causing it. Looks like nature, the way he was constituted, came first. To understand the relationship between what’s in the brain and what’s in the hand requires some historical research. There are some who would argue that the human hand developed at the same time that the human race developed a brain. Each organ evolved hand-in-hand, so to speak. As the hand developed, so did the brain, and vice versa. In fact, it has been noticed by some that if one has a stroke and the brain ceases to function, the lines in the hand disappear. Similarly, these lines only return when the brain regains function. So this homeless man’s demarcation of schizophrenia came in as an obstacle to be overcome in his lifetime. He had to learn to deal with the hand he was dealt in the best way he could. And for him, pushing a shopping cart on the streets of paradise at 64 years of age was just that. 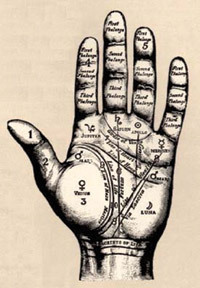 The next thing I noticed on the palm was what we call a mystic cross, planted on the mound of Jupiter, or on the fleshy part just under the beginning area of the pointer/index finger. I have discussed the writers cross previously in this column, but this mystic cross appears all alone on a mound, not connecting to any other lines or markings. When it appears all alone, the mystic cross indicates the ability to access mystical dimensions. I asked him if he had or could. Of course, he laughed. The telepaths find him and send him messages all the time, he said. Was this a classic, textbook case of a schizophrenic’s ability to hear voices? I let the issue and his palm drop, too stunned to process what this man’s hand was telling me. He was validating the existance of psychiatric categories I had protested for a number of years in my life. Perhaps the next time I teach at Pacifica I can interest a student in doing a doctoral dissertation on the relationship between psychiatric categories, the formation of the brain, and lines on the palms. Meanwhile, in the interim if you – or any one you know – has been given a psychiatric label (schizophrenic, bipolar, manic depressive, etc. ), please send me a Xerox of each palm. Tell me which is the right and which is the left, and put the diagnostic category on the back. I will read and discuss the palms in future columns, along with writing each individual back. Xeroxes can be sent to Batya Weinbaum at 1072 Casitas Pass Road, Box 224, Carpinteria, CA, 93013, with SASE and a check for $30 for normal readings. The diagnosed I will read for free as part of a community service. For $35 you can also receive my newsletter, Tending the Soul Through the Palm, electronically, so include your email address.